Looking for a way to support community gardening, meet your neighbours, and enjoy at fantastic meal all at the same time? 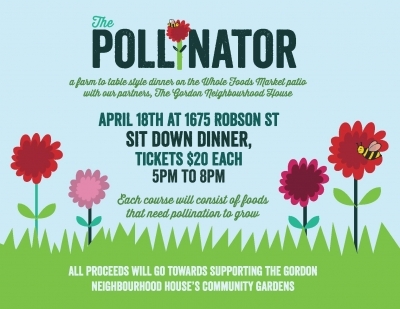 Then you won’t want to miss The Pollinator, a special farm-to-table dinner on the patio of Whole Food Market (1675 Robson Street) on April 18 from 5 to 8pm. Each course of this beautiful sit-down dinner, will consist of foods that require pollination to grow. Tickets are $20 each and will support the Gordon Neighbourhood House‘s community gardens. Email susanna@gordonhouse.org for tickets.